Oracle recently released version 3.2 of SQL Developer. This new version has some interesting new features, like the possibility to administer the APEX Listener, the option to connect to databases in the cloud, and an improved DB Diff wizard. To read more about the new features, check this page. There are both 32-bit and 64-bit versions of the software. I will explain here how you can install the 64-bit version on Windows 7 64-bit. The 64-bit version of SQL Developer does not include a Java Development Kit, but you need a Java 6 JDK to run it. If you don’t already have one on your system, you can download one here: http://www.oracle.com/technetwork/java/javasebusiness/downloads/java-archive-downloads-javase6-419409.html#jdk-6u34-oth-JPR. I downloaded and installed jdk-6u34-windows-x64.exe, the 64-bit version of Java 6 Update 34 for Windows 64-bit. If you have any previous versions of SQL Developer installed, do not remove them! You should only remove them after the new installation has finished successfully. 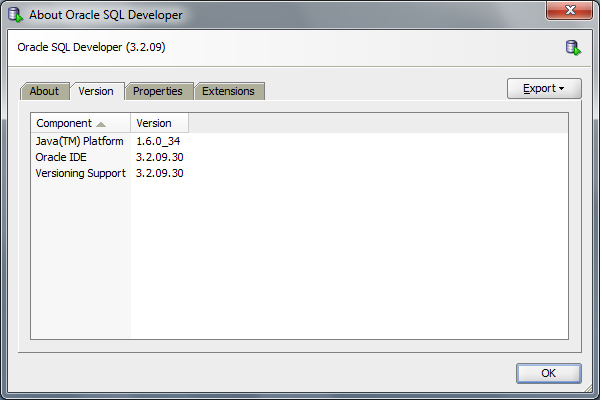 SQL Developer can be downloaded here: http://www.oracle.com/technetwork/developer-tools/sql-developer/downloads/index.html. You need the “Windows 64-bit” version. After the download, extract the “sqldeveloper64-3.2.09.30-no-jre.zip” ZIP file to a temporary folder and then copy/move the folder “sqldeveloper64-3.2.09.30-no-jre” to C:\Program Files. This is where Windows 7 by default installs its 64-bit programs and I prefer to keep it that way. Now start SQL Developer for the first time by right-clicking on “sqldeveloper.exe” inside the “sqldeveloper” folder. It will now ask for the path to your 64-bit java.exe. Browse to C:\Program Files\Java\jdk1.6.0_34\bin\java.exe. This is the Java 6 JDK that you installed in step 1. If you have any previous installations of SQL Developer installed, the new version should now show them and you will be given the possibility to import an old configuration. Might be handy to keep your connections and stuff! SQL Developer should now start up fine. You can check the version under Help -> About. When you have verified that everything works fine, you are safe to remove any older versions that you should have.